The Pope’s encyclical on the environment was officially released today, and I am relishing the response from both the secular and the religious climate movement. Surges of enthusiasm are rolling across the Internet like waves across the sea, and rivulets stream into my email inbox. Pope Francis’ landmark encyclical was addressed not only to Roman Catholics, nor only to Christians, but also to “every person living on this planet.” And all sorts of groups far and near are responding with invitations to Stand With the Pope. Hands down, the best invitation was extended by Forecast the Facts: name your identity and take your stand beside the Pope on climate. I’m a Mormon and I stand with the Pope on climate! I’m Buddhist and I stand with the Pope on climate! 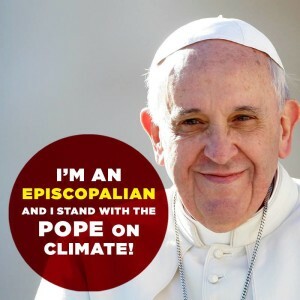 I’m a Republican… a pagan… an atheist… a Sikh… a Jew… a non-church-going Catholic… a Humanist… a parent… an Earthling… and I stand with the Pope on climate! Guess what? It turns out that preserving a habitable world, caring for the forgotten and the poor, and honoring the Earth and its inhabitants, human and other-than-human, are values that resonate deeply with the human spirit, whatever our faith tradition may be and despite the lies that are peddled to us daily by the fossil fuel industry and by an extractive, exploitative, and consumerist culture. Climate change presents humanity with a decisive spiritual and moral crisis, and the papal encyclical has added precious momentum to messages that cut through the fog of inertia, denial, and political impasse and rouse the human family to unite in tackling the crisis before it’s too late. Meanwhile the urgent work to build a sustainable, just and peaceful world goes on. Last night I sat with a group of Springfield, Mass. 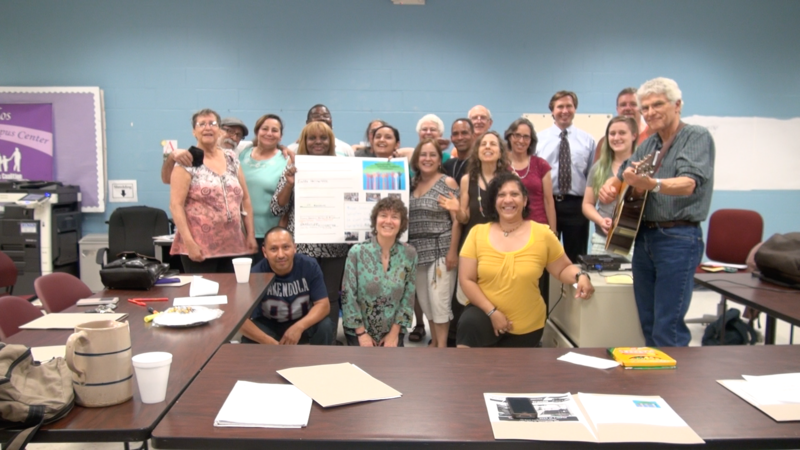 residents who are acutely aware of the health impacts of climate change on their struggling city, and the particular burden that is carried by the poor. 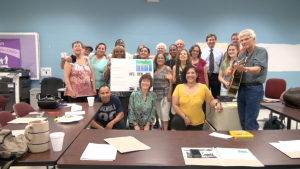 Across boundaries of race, class, and religious and ethnic background, this growing band of men and women is organizing to resist environmental injustice and to promote sustainability, resiliency and equality for all Springfield residents. Last night none of us in the Springfield Climate Justice Coalition had read the Pope’s encyclical, but tonight we can all take heart from the Pope’s understanding of the “immense dignity of the poor” (158). On Sunday I will travel to Washington, D.C., and will join about 900 other citizen volunteers – including a host of faith leaders – to lobby Congress for action on climate change. Our goal is to advance carbon fee and dividend as a solution acceptable to Democrats and Republicans alike. The Citizens Climate Lobby has made 3200 assignments, which means that every member of the House and Senate should receive a visit. How will it go? I have no idea. I’ve been assigned to meet with Republican politicians from Florida, Texas, Kentucky, and Illinois. It’s no secret that many conservative Republicans are staunchly opposed to regulating carbon emissions, and some of them began objecting to the papal encyclical even before it was released (I am grateful for the strong witness of my bishop, Doug Fisher of the Episcopal Diocese of Western Mass., who takes issue with their stance and speaks cogently about how Christians connect care for the Earth with care for the poor). 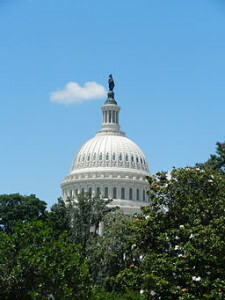 To prepare myself for lobbying on Capitol Hill, I inhale deeply, and breathe in the presence and power of the Holy Spirit. I ground myself in the love of God. I am strengthened when I recall the Pope’s thoughtful critique of unfettered capitalism, especially when it harms the poor. “Profit,” says the Pope, “cannot be the sole criterion” of our decisions (187). Christianity has a long tradition of advocating for economic justice, and I intend to carry that message forward. Today the Pope released a groundbreaking document that urges reverence for all Creation, and justice and mercy for all its residents. Tomorrow men and women around the world will get out of bed with a renewed commitment to fight the good fight – to divest from coal, gas, and oil, to keep fossil fuels in the ground, to build a society based on fairness and generosity, and to provide a habitable world for our children, grandchildren, and generations yet unborn. I hope that one day we will look back and remember the Pope’s encyclical as the electrifying moment when humanity finally grasped that we have the power to bear witness to love, and the responsibility to protect the Earth upon which all life depends. I stand with the Pope, and with you dear Peggy, on climate!